Hybrid Hosting - With the ability to host Linux or Windows web sites at no additional fees, Cloud Sites is perfect for both business owners or Windows web developers. Load Balancing with High Availability - Many service provider are still loading their customers web site and emails onto a single server which are prones to frequent down time due to hardware or software maintenance. 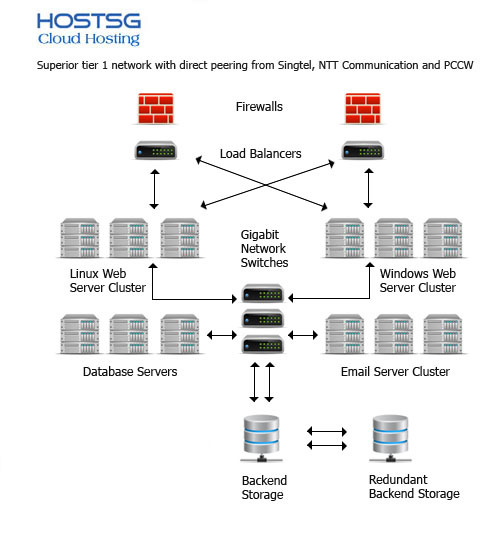 HostSG Cloud Sites improve redundancy and high availability because all your traffic and resources are spread across large powerful cluster of servers, balancing the load with minimal chance of overloading. Our large server cluster network can easily handle large traffic spike and power over 15,000 customer sites. Our unique, developed from scratch, 'cloud hosting' puts the power of a redundantly load balanced cluster of webservers at your fingertips.